For over 20 years, Vegetal i.D. has been a pioneer in the production and design of green roof systems. Innovation lies at the heart of the company's development strategy. Located on the french production site, the Vegetal i.D. Research and Development department is consistently thinking of new technical solutions to meet the growing expectations of its customers: create innovative vegetating systems that help to solve the growing issues of urban development. In 2005, Vegetal i.D. invented the first "All-In-One" green roof tray: HYDROPACK®, in compliance with professional building regulations. Vegetal i.D. 's superior expertise with its innovative green roof solutions (green roof tray HYDDROPACK®, sloped green roof solutions) was recognized by the french building regulation Centre (CSTB Building Scientific and Technical Centre). Vegetal i.D. has several patents, including HYDROPACK®, the ACROPACK® solution for sloped green roofs and STOCK & FLOW®, the green roof solution for rainwater management. The research programmes being worked on by the Vegetal i.D. R&D department revolve around 3 main themes: water management, irrigation, and diversification of plants. 1. 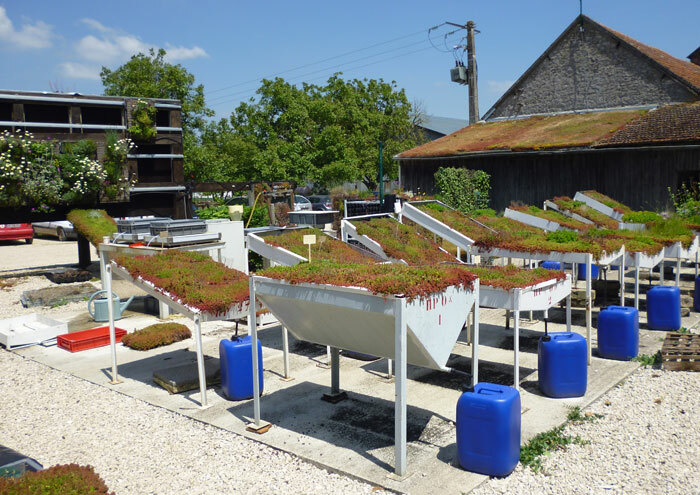 Modelling the behaviour of water in vegetated systems, with two partners: CETE lle-de France (a branch of the French government dedicated to R&D in sustainability) and INSA Lyon (a top French University for science and technology)..
2. Monthly water balances on various green roof systems (water retention, run-off coefficient, waterproofing coefficient). 3. Development of an innovative solution for the control of rainwater on the roof. As component of an "Innovative Greening" programme for the city of Paris (France), Vegetal i.D. was selected to analyse the impact of a green roof solution on stormwater management and the urban heat island effect. A similar project to assess impact on stormwater management and urban heat island reduction of HYDROPACK®, and two versions of STOCK & FLOW® is being undertaken in Milwaukee, Wisconsin in the United States as partnership with the Milwaukee Metropolitan Sewerage District, The Milwaukee Water Council, and the Fund for Lake Michigan. Vegetal i.D. R&D engineers are working on new sustainable irrigation solutions for flat green roofs, steep green roofs (up to 200%), and living walls. Plant diversification in order to create a richer and more efficient range of plants (water and maintenance) and also encourage plant and animal biodiversity in urban environments. Vegetal i.D. participates in numerous national and international innovation competitions. Vegetal i.D. won the call for proposals for the project entitled "Innovative Vegetating Projects" for the city of Paris, with the purpose of testing a solution for planting a narrow strip of vegetation on a tramway track, using a variety of plant species, grown on mats and allowing sustainable, ecological management. Vegetal i.D. participates in numerous national and international innovation competitions. As component of an "Innovative Greening" programme for the city of Paris (France), Vegetal i.D. was selected in 2013 to test a new vegetated solution for tramway track, using a variety of plant species, grown on mats and allowing sustainable, ecological management. Vegetal i.D. won a gold medal for innovation at BATIMAT, a trade show dedicated to innovations in construction and architecture for HYDROPACK®, the all-in-one green roof tray.